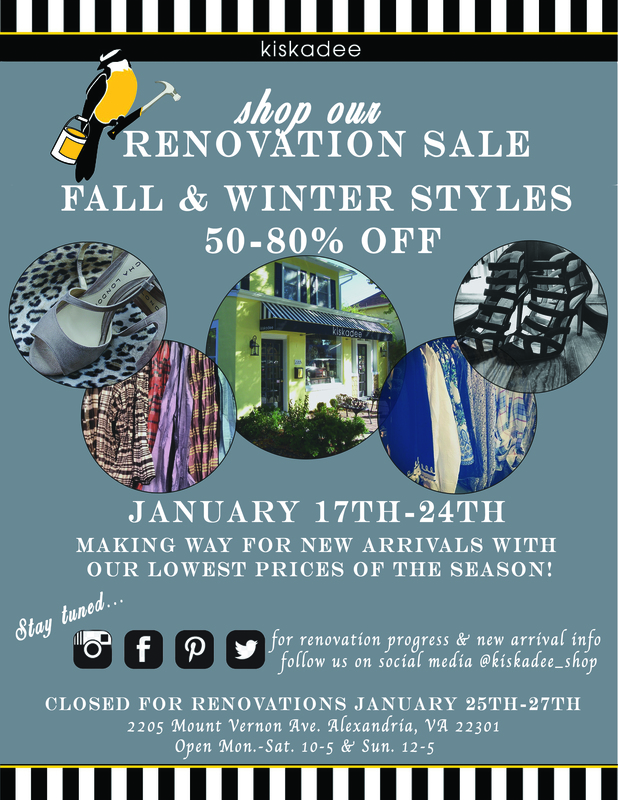 If you live in the DC metro area and you like unique, cozy sweaters, fun boots and amazing clothes in general, you should find your way to the Del Ray neighborhood of Alexandria for Kiskadee’s renovation sale. They are literally closing their doors for three days to get a facelift for spring, and according to store manager Sarah, the fewer goods they have on hand before the renovations, the better. Winter items will be up to 80% off, and trust me, I dropped by yesterday, there is still good merchandise to be had. Department stores may be hocking bathing suits, but it’s not too late in the season to pick up your new favorite sweater. After all, there is still a lot of winter left on the calendar. Starting Saturday, January 17th and running until the 24th when the tarps and painter’s tape will come out, pop by to shop the sale of the year. Just don’t take the items I’m eying.